Dance music is the main attraction at Chicago festivals this summer. “The kids are coming up from behind,” quips LCD Soundsystem’s James Murphy on “Losing My Edge.” Back in 2002, the song was just about a man grappling with aging and a youthful club scene. Today, it feels more like full-blown prophecy. 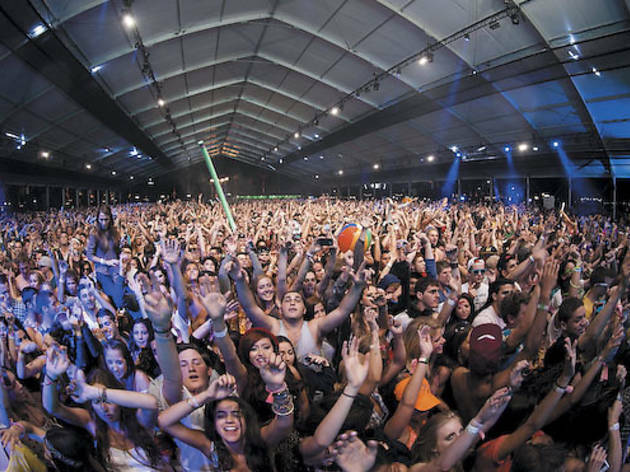 Electronic dance music, or EDM, has broken free from the underground to become the driving beat behind pop music and product sales, the soundtrack of choice for a new generation and, in Chicago at least, a focus of the 2012 festival season. If you quiz anyone over the age of 30 about the trend, there seems to be a consensus that it appeared out of nowhere. It didn’t, but even coming from someone who’s been tracking the ebb and flow of EDM for more than a decade, this surge in popularity is surprising. What is it about the insatiable stomping of beats, the dizzying flash of strobe lights and the earthquake-like shudder of all that bass that’s drawing kids to the club—and now, the festival green—in numbers that make the ’90s electronica fad seem like a joke? Early adopters of this latest EDM push, such as Lollapalooza mastermind Perry Farrell, have taken to calling it the new rock & roll. The tag has gained so much traction, it’s verging on cliché. That doesn’t mean it’s off the mark. For twentysomethings weighed down by debt, meager income, the ailing economy, blah, blah, blah, this euphoric music offers an idyllic escape no longer found in rock. On the dance floor, reality gives way to the rave. Glowsticks and an arsenal of other light-up circus toys hypnotize, your troubles whisked away as effortlessly as the beach balls that float by overhead. The hardships of adulthood are also tempered by Ecstasy (or Molly, as the kids call it these days), a drug that’s long gone hand in hand with EDM. This time around, it’s set to the epic buildup and breakdown of electro-house or the unrelenting and belligerent intensity of dubstep. Thanks to the DJ, it’s not uncommon to get doses of both over the course of the night. And in a world where YouTube, Pandora and shuffling iPods are the preferred ways to consume music, the DJ is the new rock star. A DJ provides the variety this ADD generation demands. Plus, a solo artist will inevitably play that sad song about breaking up with his girlfriend; a DJ will ratchet up the party with one hit after another—higher, higher, higher—until euphoria hits. This sense of community has gone a long way to further EDM’s allure. Maybe it’s our fractured world of micro-interests spread across the Web, or social networking hogging all of our would-be face-to-face time. 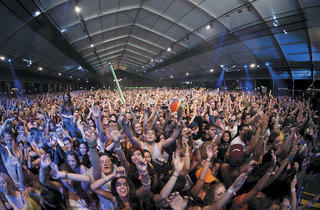 People, especially young ones, seem to crave the togetherness—call it the collective hang—of a DJ-driven dance party. It seems cheesy to assign it such spiritual significance, but I’ve never witnessed a movement so unified as when 3,500 kids are bobbing their hands up and down in tandem to the low-end blasting at any of Congress Theater’s sold-out dubstep shows. I’m getting used to it, though. With EDM’s rise and the increasing number of festivals dedicated to the genre, we’re going to be hearing it a lot this summer, and most likely for many summers to come.